Christian Bale got plenty of experience taking the law into his own hands in the Dark Knight trilogy, playing that awesome vigilante known as Batman, but here in Scott Cooper's Out of the Furnace he's approaching that same idea from a very different angle. Surrounded by a cast of supporting players including Casey Affleck, Zoe Saldana, Sam Shepard, Woody Harrelson, Forest Whitaker, and Willem Dafoe, the upcoming drama instead looks like it will be a gritty crime drama that very well could find itself in the heart of this year's Oscar race. And today thanks to Apple, we know have a much better idea of what they have in store. Scripted by Cooper and Brad Ingelsby, the film tells the story of Russell Baze (Bale), a blue collar worker with a rough life, spending days working at the steel mill and nights with his dying father. Things begin to look a little brighter when Russell's brother Rodney (Casey Affleck) returns home from Iraq, but soon things take a dark turn when Rodney is lured into a ruthless crime ring. After Rodney disappears Russell turns to the police for help, but when they fail to turn up answers he goes on a mission to get his brother back at all costs. As we noted when the movie's first official stills were released earlier this week, Out of the Furnace is the first film that Bale has been in since the release of The Dark Knight Rises last summer - but he actually has a pretty busy fall. In addition to having Cooper's film coming out in November, later this year we will also get to see the actor reunite with The Fighter director David O. Russell in the ABSCAM pic American Hustle, which will be out on December 13th. He is also part of the ensemble cast that makes up Terrence Malick's Knight of Cups, starring alongside Teresa Palmer, Natalie Portman, Joel Kinnaman, Cate Blanchett, Antonio Banderas and more, but that film does not yet have a release date. 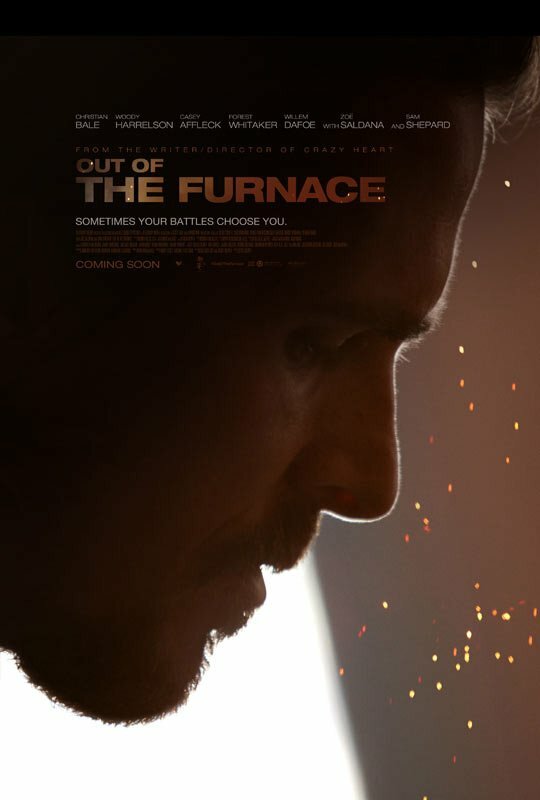 In addition to the trailer, Apple is also hosting the first poster for the movie, which features a forlorn Christian Bale at the steel mill (we're assuming, because of the sparks). Check it out below. Out of the Furnace will be one of the many films coming out during the week of the Thanksgiving holiday this year, though it will only be getting a limited release. Other films set to come out that weekend include the musical Black Nativity, Disney's Frozen, the action/thriller Homefront, and the twin Weinstein-produced biopics Grace of Monaco and Mandela: Long Walk To Freedom.